Vitamin E – It's Sooo Essential! 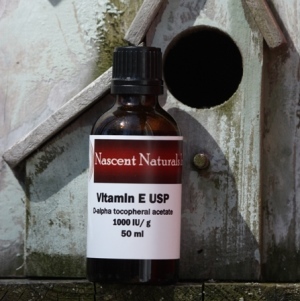 | Nascent Naturals Inc.
Home Education Vitamin E – It’s Sooo Essential! Natural vitamin E is both an anti-oxidant and vital to the nutrition of the skin. Use only pure mixed tocopherols from vegan source such as soybeans. It is very dark in colour and must be kept out of direct light. Only purchase if it is in dark amber bottles. It has become quite expensive so be careful that you are purchasing pure and not diluted. Vitamin E pre mixed with vegetable oils loose the anti-oxidant properties so don’t waste your money on those. Synthetic vitamin E is less expensive, but not nearly as absorbent, lacks nutritional value and may cause reactions as many are mixed with petroleum products to extend shelf life and reduce costs. You can tell the difference as it is always clear to light amber colour and leaves a sticky residue so don’t bother with this stuff either. Many people will apply it directly to the skin and think it is beneficial, but for best results, add 1-2 % to a natural cream, lotion or carrier oil such as coconut or jojoba oil. The molecules are dispersed effectively, absorb faster into the skin and will save you a lot of money.